[XPB-BEWHUS-X] Baked Enamel Urinal Screens are fabricated in sheet metal insulated with a moisture-resistant honeycomb core. Panels are 1" thick and hardware is included. 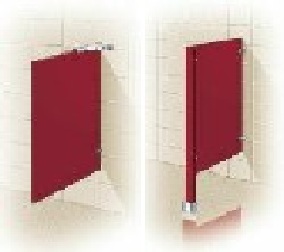 Wall Hung Urinal Screens are offered in choice of 12", 18" and 24" Widths, and Heights of 42" or 48". Available in 21 Color Selections. Options to upgrade Brackets to Wall Hung Wing, Floor Mount, Wall Hung with T, or a Continuous Hinge with Flange available. See diagrams for more detail. Option for a Privacy Screen to your Specification. Engineering drawings will be provided. Factory Specifications, Installation Instrctions and detailed information available upon request. For shipping quotes, orders or questions please call our Customer Service Center at 1-877-483-9270.